When the people of Dream Land stop dreaming, Kirby finds King Dedede bathing in the Fountain of Dreams. The greedy king broke apart the Star Rod that powers the fountain and gave the pieces to his friends. Kirby sets out to gather the pieces and restore the Star Rod. As well as inhaling enemies and floating, Kirby has gained a new move: after eating an enemy, Kirby may gain that enemy's ability. These special abilities can help to defeat enemies and solve certain puzzles. Each world has minigames you can play for 1UPs, and a museum where Kirby can pick an ability to use. At the end of each world is a boss enemy that must be defeated for a piece of the Star Rod. 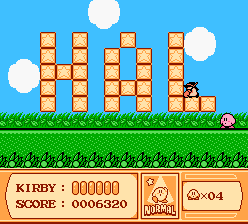 At the end of Vegetable Valley 2, you can find the word "HAL" spelled out in Star Blocks. 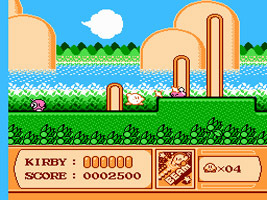 HAL Laboratory is the developer who made the game. The title screen music for Kirby's Dream Land appears in the Sound Test, but doesn't appear anywhere else in the game. The final stage on Rainbow Resort is made up of areas taken from all four stages in Kirby's Dream Land on Game Boy. 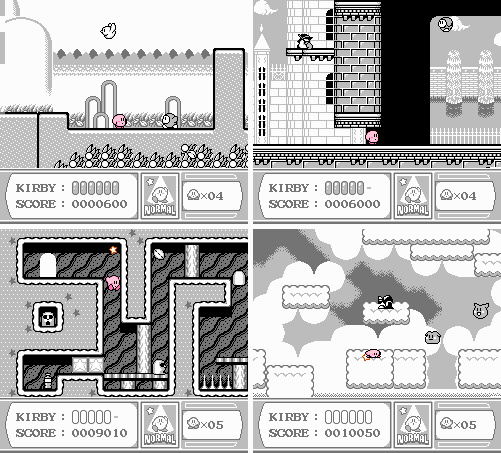 The level even appears in four shades of black, grey and white. The game's Kirby drawing introduction is based on the Japanese TV commercial for Kirby's Dream Land, where a kid sings the song while drawing a picture of Kirby.